With VEGAS Movie Studio Platinum as your creative partner, transform your video clips and digital photos into lasting memories. Easy-to-use pro-level editing tools along with flashy titles and effects provide pure inspiration, not just video editing software. 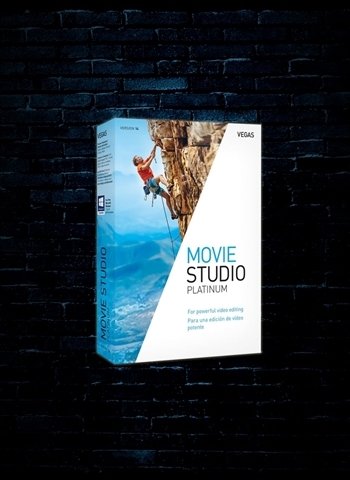 Designed for fast editing and enhanced creativity, VEGAS Movie Studio Platinum empowers your creative process with versatile editing tools and an incredibly powerful feature set. Move from one scene to the next with a bounce, a shake or a shift in color. These are just a few examples of what makes transitions from NewBlueFX so much fun. Get creative results fast with the built-in presets or tweak any or all of the parameters to create your own new twist on these award-winning video transitions. VEGAS Movie Studio video editing software and NewBlueFX: a perfect creative partnership. Designed to be easy for any movie editor to use but with features that the pro musician expects, Music Maker software provides exactly what you need to create a custom music track for your video. Build excitement, add romance, and crank up the emotional factor with music. Create the basic arrangement with loops, add software instruments, add your voice, and then put it all together with professional effects and mastering tools.